It is no secret that I love cookies. In fact, I have a few almost every night with a glass of milk while relaxing with Mike on the couch after Ava finally goes to bed. My favorite – chocolate chip – and I cheat by baking up batches of Pillsbury’s Simply Cookies [as you will find out in tomorrow’s post, I am not a baker]. Growing up, we always had trays and tins full of cookies to eat at Christmastime. My gramma must have been baking them in her sleep. One of my holiday favorites are Russian Tea Balls [or Russian Tea Cakes or Mexican Wedding Cakes]. I have lost more than one of these in my glass of milk. 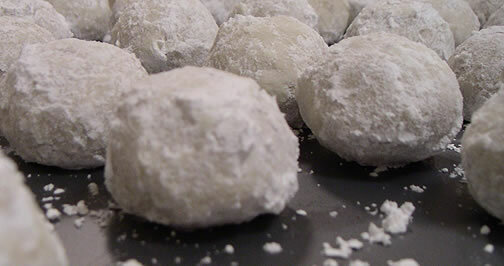 Nutty, cakey, little balls of goodness covered in powdered sugar … and fairly easy to make! I found a great recipe for these at Peppercorn Press. 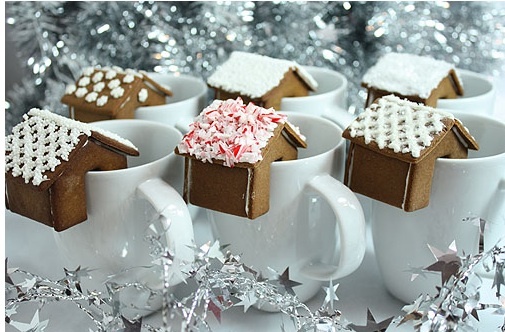 How cute are these little gingerbread houses?!?!?! Thanks to Megan of Not Martha you can print out a pattern and start building your own tiny houses to accompany your mugs of coffee, hot chocolate, egg nog, etc. Mike and I were thinking this recipe would be great to make little Santa’s to hang on your mug or snowflakes or candy canes or whatever. Maybe one day I will give it a try and if you do, I would love to see the results! 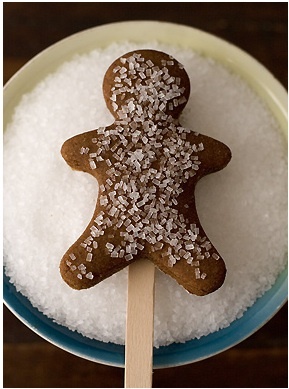 While we’re on the subject of gingerbread, check out this recipe for Gingerbread Man Cookies [on a stick!] created by Heidi Swanson of 101 Cookbooks. Kids will LOVE these! Gaby Dalkin of What’s Gaby Cooking? 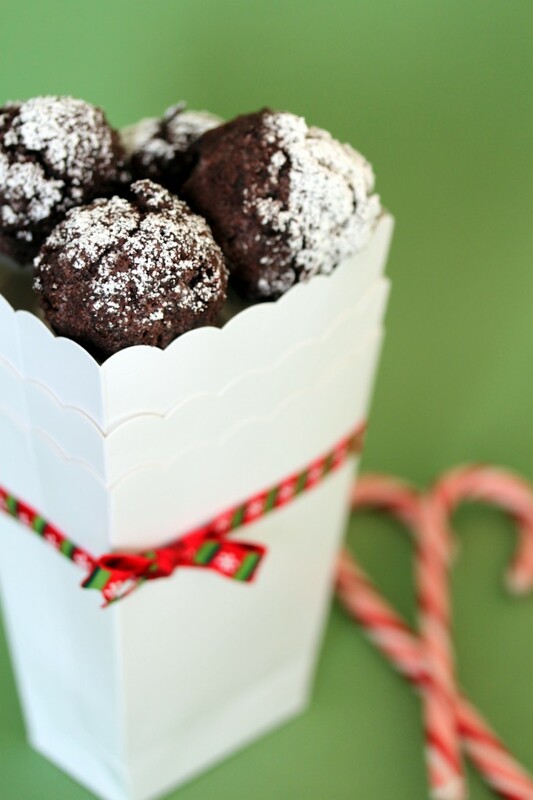 is to thank for these Chocolate Snowballs. It’s basically a delicious chocolate cake and some cream cheese frosting rolled into cute little balls of goodness and dusted with powdered sugar. Mmmmmm. Now, this next recipe isn’t exactly a cookie, but it is a major Christmas sweet treat staple for my family [Ohio]. 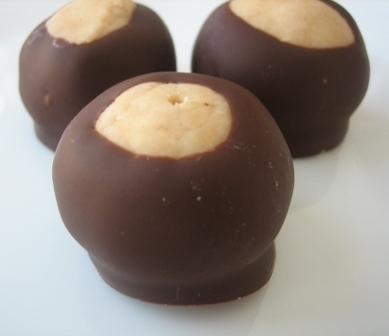 Buckeyes aka Peanut Butter Balls. Sugar coma, here I come. The family recipe Michelle from Brown Eyed Baker [or her old blog, Sugar & Spice] uses is pretty close to the Buckeyes my gramma makes. 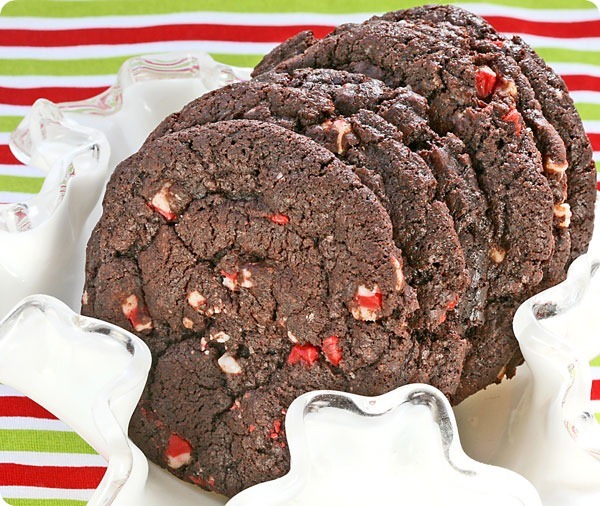 I love chocolate and Mike loves candy canes, so these Double Chocolate Peppermint Cookies are perfect for us. Just looking at them makes my mouth water. Get the recipe from Susan at Sticky Gooey Creamy Chewy. 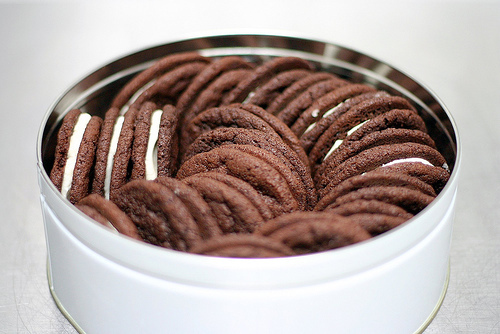 Who can resist the crunchy creamy goodness of an Oreo? Not me. And even better? A Homemade Oreo from Deb at Smitten Kitchen. OMG these look amazing. Milk!!! I need milk!!!!! And to wrap things up … I couldn’t have a Christmas Cookie Roundup without including some fruit and nuts. 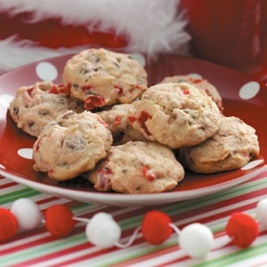 This recipe for Cherry Chocolate Nut Cookies comes from Sybil Brown, via Taste of Home. So there you have it. Eight amazing Christmas treats to fatten up Santa [and your friends]. If you have an awesome Christmas cookie recipe, let me know and we can share it! XO!